Fremont,CA – Cenergy Solutions, the leader in commercially viable Adsorbent Natural Gas (ANG) systems technology, will be debuting the world first Adsorbed Natural Gas (ANG) equipped passenger vehicle, a Honda Civic, and a 2016 Ford F-150 with a conformable, ANG tank at the ACT Expo in Long Beach, California May 2nd through May 5th. Cenergy Solutions ANG technology allows tanks to adsorb and efficiently desorb more CNG at substantially lower pressures (350psi – 1000psi) and can be applied to virtually any type of natural gas storage system, including CNG vehicles, CNG station and bio-methane ground storage, virtual pipelines and fugitive/ wellhead methane capture systems. Cenergy’s exhibit will feature an OEM, dedicated CNG Honda Civic and a Ford F-150 pick-up truck. The 2012 Honda Civic will have a standard, 3,600 psi, Type-3 CNG cylinder equipped with Cenergy’s patent-pending ANG system. 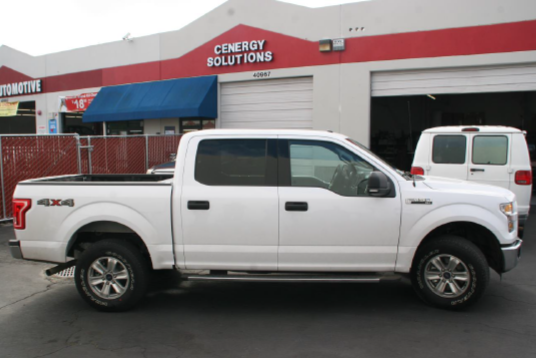 The 2016 Ford F-150 will feature a conformable, low-pressure, aluminum tank that will be a game-changer in the CNG transportation market. The tank in the F-150 will feature a Blackstone fill valve that limits fueling to the tanks 488 psi operating pressure and Rotarex PRV’s. Cenergy’s ANG technology is a significant step toward solving the challenges for broad and rapid adoption of clean, affordable, abundant, domestic natural gas and bio-methane as a transportation fuel. The lower-pressure ANG technology enables the market for conformable CNG storage solution for full-scale, affordable NGV-hybrid deployment in the United States, and internationally, by allowing tanks to fit more easily into the design of existing vehicle platforms. Moreover, the lower compression pressures required to fill Cenergy’s ANG systems allows for the more rapid growth of a ubiquitous CNG refueling network. Due to the significantly lower capital investment associated with lower compression requirements, CNG infrastructure will be more easily and cost-effectively added to the network of gas stations and truck stops. ANG also creates a market for compact, affordable, low-pressure CNG Home Refueling Appliances (HRA’s) that will allow consumers to fill their vehicles at home. Cenergy will also be giving a presentation on its ANG system during the NGVAmerica Technology Forum at the ACT Expo on Monday, May 2nd at 3pm PST.